How do I loathe thee? There are some that love you to the point of delusion, going on and on about your magical properties of making a project turn out perfectly EVERY. SINGLE. TIME. You make the sweaters fit and tension never change. You control the weather and make crops grow. I would not be surprised if you have been hailed as a fertility idol at some point in time. How your followers love you so, oh Swatch that Foretells the Gauge. But to me? You are a pain in my side and lie to me every single time. I tried to do the RIGHT thing so many other knitters chastise me for neglecting. “Your sweaters will NEVER fit and you will have wasted money on yarn,” they tell me over and over. Since I did not have an actual pattern to work off of, I knit you and with my normal tension (just ever so slightly tight). I got my gauge. I did my math–and I am good at math, none of this “girls can’t do math” garbage for me, thanks–and in the banding of the sweater, I should have had zero ease and then gone from there. Things were looking good, but due to some errors and lack of thought about my lace pattern, I needed to take two day’s worth of knitting off the needles to rip back to the band. It occured to me while I ripped that perhaps I should try the band on since the sweater was off the needles anyway. What did I find to my horrer? THE BAND WAS FIVE INCHES TOO BIG. BOO to you, Gauge Swatch. BOO. All my other sweaters have been knit without swatches and turn out fine. I do a swatch and you send me a sweater that is way too big? You are not worth worshipping and idolizing. The Purl Beret is finished as well. Other then a small area of color pooling, this turned out lovely. You never know what you’ll get when you work with striping sock yarn. There’s another half a skein of sock yarn gone! Because of lack of 16″ circular needles, I cast this on some slightly longer ones and added stitches accordingly. I think I could have made it a bit larger still, or else increased needle size. But overall, I’m happy with it. Time to move onto the next project! Tuesday, my “emergency” second skein of Malabrigo arrived and I was able to finish my beret that night. It took awhile to get the pictures taken, though. (Our apartment is in a state of chaos since our closet had to be torn apart due to a burst pipe in the next unit. So pretty much everything we own is out of the closet and everywhere else. It’s crowded in here.) 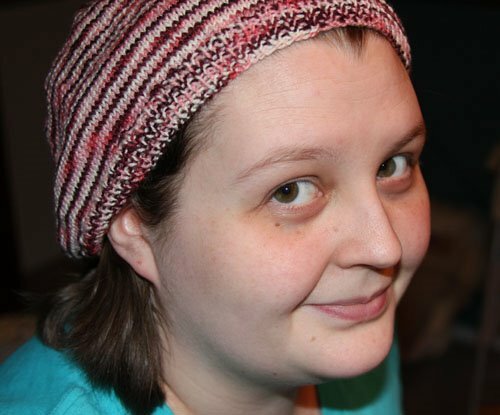 The silk in my yarn choice made the beret more slouchy and gave it a different drape, but I like it that way. I would gladly make another of these in the same yarn. Malabrigo doesn’t make any crimson reds in this line, so I’ll have to look for another. I needed only 8 grams of the second skein of yarn, so now I need to figure out what to do with another 122-ish yards of Malabrigo…I may wait until I decide if I want to make a sweater out of it and save it for that. Now I’m just finishing up a Purl Bee beret for myself and should be done tonight or tomorrow, then I need to decide if I’ll finally cast on my Jaywalkers or work on my Anne Elliot Spencer sweater. I have yarn caked for both, it just depends on what suits my mood, I suppose. I’m not so much in a sock mood, so it’s a safe bet that I’ll work on the mini sweater instead. Anywho, Happy Holidays and Merry Christmas to all who read my blog! Time to get into gear for 2009. 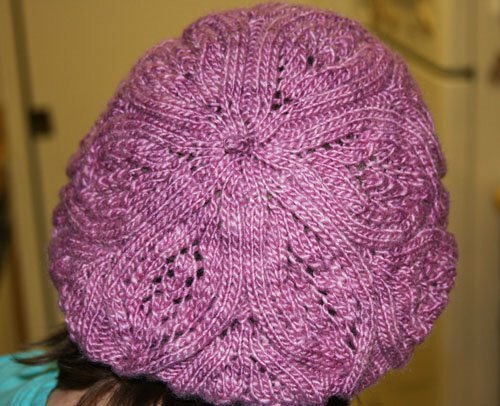 The Beret I featured in my last blog is on hold until a second skein of Malabrigo Silky Merino can make it my way. With any luck, it will be Monday. I’m 12 rows from the end–so close. Had I been paying closer attention and not still in newborn mode, I would have noticed that I had 100 fewer yards of yarn then the pattern called for. I’m sure I will not need that many, but I will need to use part of a second skein of yarn. In preperation for my 2009 knitting resolutions, I’ve been contemplating ways to use up sock yarns and scraps that do not include knitting socks. So far, I have ideas for two patterns that I’ll publish on this blog shortly; the first I just finished tonight. I have a bad habit of buying sock yarns, buying a single skein, and then not knowing what to do with them. ( I can’t help myself, I am a color junkie.) Lately, I’ve been having zero luck destashing on Ravelry and they have to get out of my tote somehow! Thus, “Things to do with sock yarns and scraps,” will be born. Though it needs a more brief name that doesn’t trip on the tongue. Tonight, I plan to cast on my second Purl Beret in an attempt to use up part of another skein of sock yarn. The stuff breeds like rabbits, I swear! What is life without some pretty hats? As of yesterday afternoon, it was finally done! I didn’t hate this knit, but stopping part way through made me lose my steam. I’m glad I was able to resist the other yarn and projects calling my name to get this one done. Now I can be happy knowing I stuck it out. I’m happy with it and think I’ll get more wear out of it then some of my other projects and now that I know how much yarn my size takes, I know I have enough to make one more. I don’t plan to start it for awhile though. Modifications to the pattern include using the Large size for width but the Medium for height and then I subtracted 4 more repeats from that. Made as written, it would have been down to the top of my hips. We shorties need to be careful of that. The Wollmeise was nice to work with, but not so nice that I’d stay up half the night F5ing to get my hands on more. I’d like more in the future, but I’ll try to wait until the hype around it has died down and all the ravenous Wollmeise hoardes realize they no longer have room in their homes to stash another skein. Seriously, this yarn is treated like precious metal and gems by some who have so much they’ll never knit it all. Good luck trying to buy it outright, you need more Wollmeise to trade for it. I lucked out and another user happened to see a post of mine and offered me a skein of hers if I promised not to reveal her identity. Wollmeise is serious business. (About as serious as Sundara whose lovers play the same dirty game: you want some, you have to fight them for it and grab any you can just to trade. It does not matter that you hate the color; you must have it solely to sit on and wait for a color you do like to come up for trade.) Forget hoarding cigarettes if the end of the world comes, grab all the Wollmeise and Sundara you can and trade for necessities later. Anywho, a picture of my current project. Malabrigo Silky Merino may be one of my new favorite yarns. MMMmalabrigo. I was afraid to get a sweater’s worth so I bought a single skein to try out. It is lovely. And this shade of purple doesn’t hate my skin, so I will be purchasing more in the future. I love purple, always have, but most shades do not play nicely with my skin, which is a shame. Plum Blossom, I dream of you as a sweater. Now back to petting this yarn and marveling at how nice and squishy it is. Yes, I do have to keep telling myself this to push through this knit. Doesn’t help that I now have 300+ stitches of garter edging to pick up and then the arms. Though I will admit, I just learned how to do a 3 needle bind off and that is one slick trick. Definitely using that instead of grafting when I can.